Just wanted to share a Glee-ful giveaway from our friends at the publishing house Clan Thompson. The next *5 people* to purchase Clan Thompson’s “GLEE! An Easy Guide to Gluten-Free Independence” (by Elizabeth Atkinson) will each receive three 18-piece packs of gluten-free *GLEE* GUM as well as a coupon for more gum fun! FOR MORE INFO on Elizabeth Atkinson’s book, “GLEE! An Easy Guide to Gluten Free Independence”, or to BUY A COPY, click here! You can also ORDER by visiting Elizabeth’s website here and clicking on “www.clanthompson.com”. 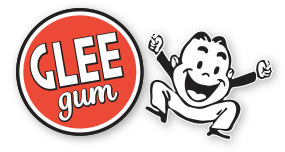 Either way, just be sure to order through Clan Thompson and write “Glee Gum Giveaway” when you order! For more info on enjoying the gluten-free lifestyle, be sure to check out Elizabeth’s GLuten-frEE GLEE! Blog right here! I gotta say: LOVE the book title! And I’m plum crazy abut the cover photo. Wonder if I could strike a similar pose? Might be hard without a torso… Well, here I go!